When you think of upgrading your home’s insulation, the attic is often the first area that comes to mind. Air naturally moves through a house from ground to sky. By focusing your dollars on an attic upgrade you are focusing on the number one area of energy loss. Fiberglass insulation is a cost-effective insulator. Fiberglass insulation is a low-cost product that is easy to install. It can easily be blown over existing insulation, creating a complete blanket to help reduce energy bills and keep your home comfortable. Fiberglass insulation is a green product from manufacturing to installation. Fiberglass insulation is manufactured primarily from recycled glass. This means there are fewer natural resources used to manufacture fiberglass insulation than some other types of insulation. When installed, fiberglass insulation over its lifetime saves more energy than it took to produce. If you’re looking for a green product to insulate your home, fiberglass insulation is ideal. Adding fiberglass insulation to your attic is one of the most cost-effective ways to save money on your energy bills each month. 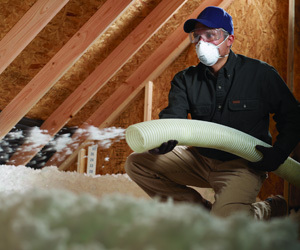 Wondering if your home could benefit from additional attic insulation and air sealing? Contact us for a free estimate.